Most students of American history are aware that Woodrow Wilson (the 28th president) suffered a serious stroke during his second term in office. What is less known (and not known by almost anyone at the time) is that he was almost completely incapacitated for several months. His second wife, Edith, was both figuratively and literally his gatekeeper…managing many of the affairs of the presidency and keeping curious Cabinet members away from the president. 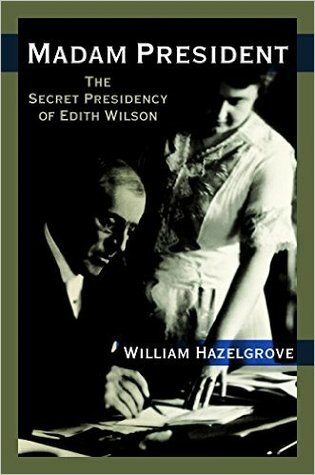 I first became aware of Edith’s story during the summer of 2015 when I spent two months reading six of the best biographies of Woodrow Wilson. It was quickly clear that she was one of at least two fascinating characters in Wilson’s life – the other being Colonel House, his closest adviser. A biography of House, which I have not yet read, was released in 2014. This biography of Edith Wilson, which is being released tomorrow (October 17), has not been widely reviewed prior to its publication but I am hopeful it captures the drama and intrigue of Wilson’s second presidential term. “After President Woodrow Wilson suffered a paralyzing stroke in the fall of 1919, his wife, First Lady Edith Wilson, began to handle the day-to-day responsibilities of the Executive Office. Mrs. Wilson had had little formal education and had only been married to President Wilson for four years; yet, in the tenuous peace following the end of World War I, Mrs. Wilson dedicated herself to managing the office of the President, reading all correspondence intended for her bedridden husband. Though her Oval Office authority was acknowledged in Washington, D.C. circles at the time—one senator called her “the Presidentress who had fulfilled the dream of suffragettes by changing her title from First Lady to Acting First Man”—her legacy as “First Woman President” is now largely forgotten.